Drafted into the NBA sixth overall by the Boston Celtics in 1978 Bird started at small forward and power forward for thirteen seasons spearheading one of the NBA's most formidable frontcourts that included center Robert Parish and forward Kevin McHale. Bird's competitive nature often emerged in nearly constant trash-talking on the court. Bird was widely considered one of Red Auerbach's favorite players. 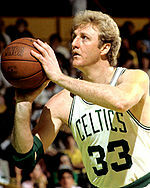 Larry Joe Bird (born December 7 1956) is an American former NBA basketball player coach and team president. Drafted into the NBA sixth overall by the Boston Celtics in 1978 Bird started at small forward and power forward for thirteen seasons spearheading one of the NBA's most formidable frontcourts that included center Robert Parish and forward Kevin McHale. He served as head coach of the Indiana Pacers from 1997 to 2000.